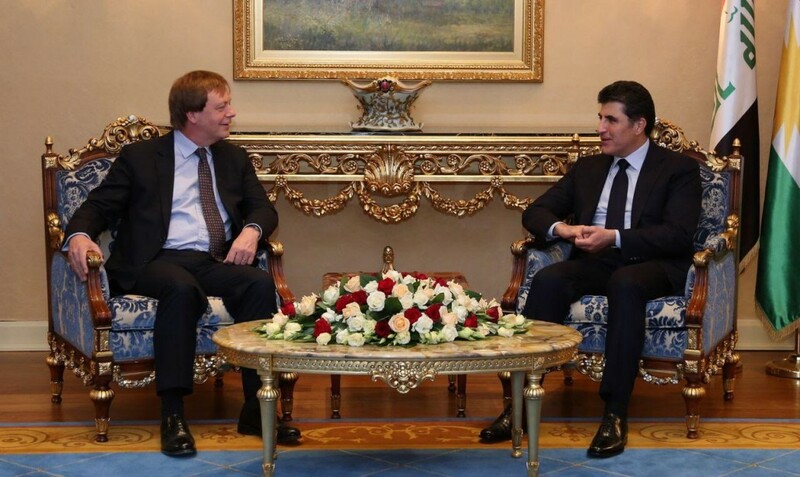 Erbil, Kurdistan Region, Iraq (cabinet.gov.krd) – Prime Minister Nechirvan Barzani received Frank Baker, British Ambassador to Iraq, and his accompanying delegation. Ambassador Baker discussed regional developments, including the fight against ISIS and the operation to liberate Mosul. He commended the battlefield accomplishments of the Kurdistan Region military forces, the Peshmerga, and their cooperation and coordination with the Iraqi forces in the fight against ISIS. He also commended the people and government of Iraqi Kurdistan in their efforts against terrorism and hosting and assisting an extraordinary number of displaced people. Ambassador Baker affirmed the UK’s wilingness to continue its relations with Kurdistan Region in all sectors. The two sides also discussed the situation in Iraq, and the Region’s decision to conduct an independence referendum in September. Prime Minister Barzani expressed appreciation to the British Government for its support to the Kurdistan Region. Regarding the scheduled referendum, Prime Minister Barzani reaffirmed that Kurdistan looks towards finding a way forward that would guarantee the region’s peace and stability through serious dialogue with Iraqi Federal Government, to be engaged following the referendum. Prime Minister Barzani also affirmed that the independence referendum will not hamper the Kurdistan Region’s efforts in fighting terrorism, but it would further strengthen the Region in its war against terrorism, which is a serious threat to the world security.